As a healthcare professional, a certified nursing assistant (CNA) assists patients with various physical and healthcare needs, under the direct supervision of a licensed nurse. A CNA works in various medical environments, including hospitals, nursing homes, patients’ homes, and assisted living facilities. The role and responsibilities are slightly different in each setting. Common duties include assisting patients with daily living activities that they cannot do for themselves, measuring vital signs accurately and maintaining a record, keeping a clean environment, listening to patients’ concerns and reporting to a nurse or physician, and assisting patients with mobility. CNA classes help students develop the ability to perform basic nursing skills with an emphasis on compassion, patient safety, and respect for patients’ rights. 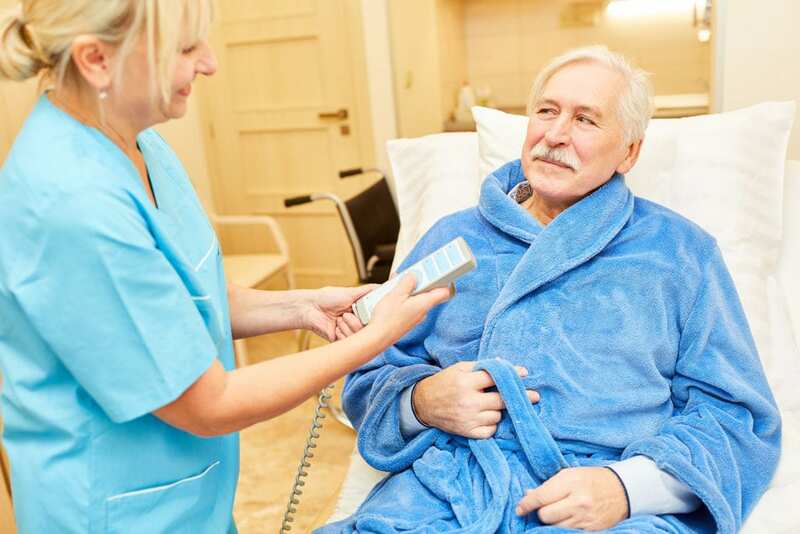 Among the basic skills are measuring blood pressure, pulse, and fluid intake and output, caring for patients in hospice facilities, maintaining medical equipment, communicating and collaborating with other healthcare professionals, and observing patients for irregularities. Nurse aides must know how to assist patients with personal care such as bathing, grooming, eating, and dressing. They will empty bedpans, make occupied beds, and keep the facility clean. By utilizing the knowledge and skills gained in the program, nurse aides will make a difference in the lives of their patients and have the fundamental preparation for continued studies in nursing. Ross Medical Education Center’s Nursing Assistant training prepares the student for entry-level employment in an acute or long-term care facility. The curriculum meets the state’s training requirements for nurse aides so graduates will be eligible to sot for the State of Michigan Nurse Aide Certification Examination administered by Prometric. Day and evening classes are available to meet students’ needs. The class size is limited to 22 students per instructor in the classroom. The student per instructor ratio during the clinical experience is 12 to 1. The tuition of $98 includes a $25 non-refundable application fee. A state-approved Certified Nurse Aide (CNA) training course is made available through the Goodwill Employment Center. The program exceeds state requirements by offering 115 hours of classroom theory and hands-on practice to prepare students for providing direct care in various medical environments especially long-term care. Students will have the opportunity to care for residents on long-term care facilities under the direction of an experienced nurse instructor. Course topics include basic nursing skills, vital signs, medical terminology, anatomy and physiology, hospice care, personal care and grooming, communication and interpersonal skills, nutrition, and patients’ rights. Students will also receive health care level CPR certification. Goodwill also offers open lab hours for students to practice their skills before the state certification exam or refresh their skills after employment. Classes meet Mondays, Tuesdays, and Wednesdays from 5:30 pm to 9:30 pm. A morning schedule is also available with class times of Mondays, Wednesdays, and Fridays from 8:30 am to 3:00 pm. Persons interested in enrolling in the program must attend a virtual information session. Tuition costs $1,800 and includes CPR certification, TB test, one set scrubs, one-time state testing fee, and one-on-one tutoring. Several funding options are available. Job placement and retention services are available to graduates. Students enrolled in the Nursing Assistant program at Walker Medical have several options for schedule. The curriculum covers 80 hours of classroom theory and practical experiences that can be completed in 2, 3, or 4 weeks. It will include 30 hours of classroom theory, 20 hours of lab practice, and 30 hours of clinical activities is a skilled nursing facility. The goal of the program is to prepare students to provide basic nursing care in a long-term facility. Graduates will obtain a Certificate of Completion and will be eligible to take the State Nurse Aide Exam to be added to the Nurse Aide Registry. WMIS demonstrates its commitment to students’ success by offering a free 6 to 8-hour review class to graduates who do not pass the state test on the first try. The review class will cover the skills that will show up on the state test. The two-week day and evening classes meet Monday through Friday from 8:00 am to 4:00 pm or from 2:00 pm to 10:0 pm. A six-week day and evening class or four-week day and evening class is also available. Tuition costs $1,100 to $1,300 depending on the schedule. A flexible in-house payment plan is available. Additional costs include state test fee, book, blood pressure cuff, stethoscope, gait belt, and uniform. Hans Medical Institute’s Certified Nursing Assistant Training Course (CNA) includes all the training students need to assume entry-level employment in acute and long-term care facilities. The curriculum covers 90 hours of theory and practical instruction. Experienced, compassionate, and committed instructor guide students in the classroom and oversee patient care activities in a skilled nursing facility. Students who miss more than 8 hours of lab or clinical activities will be dismissed from the program. The duration of the program is approximately three weeks depending on the schedule. Day and evening schedules are available. Day classes meet Monday through Friday from 9:00 am to 2:30 pm. Evening classes meet Monday through Friday from 4:00 pm to 10:30 pm. Hans Medical offers an additional six hours of review to students who do not pass the exam on the first attempt. Tuition costs $600. The registration fee is $250. Students must cover the cost of the state exam, watch with a second hand, stethoscope, and purchase the required uniform for the clinical rotation. Stepping Stones prepares students for a career as a Certified Nursing Assistant in just three weeks. The state approved program is taught according to the guidelines for nurse aide training. The theory and lab sessions will be conducted onsite, and the clinical rotation will take place at a local long-term care facility. Course topics include basic nursing skills, medical terminology, anatomy and physiology, personal hygiene, nutrition, communication and interpersonal skills, patient safety, patient rights and independence, range of motion exercises, vital signs, and observation and reporting. Graduates will receive a certificate of completion that confirms students’ eligibility to take the State Certified Evaluated Nursing Assistant (CENA) test to begin working as a Certified Nurse Aide. The cost of the program is $1,390 and includes tuition, registration fee, and criminal background check. The registration fee of $275 will be waived if the cost if paid in full. Easy financing options are available to all students. Grand Rapids Community College’s Certified Nurse Assistant program prepares students with the skills to provide direct care in various health care settings. The four-week program includes classroom work, skills lab, and supervised patient care experiences in a skilled nursing facility. The clinical component will account for 28 hours of the total program hours. Students will learn how to measure vital signs, assist patients with the activities of daily living, effective written and verbal communication, and rehabilitative and restorative care skills. They will also perform CPR and demonstrate proper eye/hand coordination. Students benefit from small class sizes, integrated learning and the use of simulation of the work environment, and input from area employers. Graduates will be eligible to take the State of Michigan Nurse Aide exam. Candidates for the program must attend an information session. Tuition for the program includes the criminal background check fee, certification exam fee, course uniform, textbook, supplies, WorkKeys talent and fit assessment fee, and computer competency assessment fee. Flat River Medical’s nursing assistant curriculum is modeled by State of Michigan guidelines for nurse aide training. The training covers 75 hours of lectures and presentation in the classroom, hands-on lab practice, and a clinical rotation in a nursing home. Students will learn the importance of providing safe and compassionate patient care and methods of promoting patients’ well being. The program admits new students every month. Day and evening schedules are available to accommodate students’ needs. Students who successfully complete the program will be eligible to take the state certification exam conveniently offered at Flat River’s facility. Tuition costs $1,600 and includes two pairs of scrubs, gait belt, lab and equipment fee, blood pressure cuff, stethoscope, testing center fee, lifetime support, and one-on-one test preparation. Job placement assistance is available to all graduates.